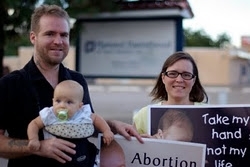 Bud and Tara Shaver are full time pro-life missionaries in Albuquerque, New Mexico. Their ministry encompasses its name, “Prayer and a Pro-life Witness.” As former Operation Rescue interns they have learned proven strategies to close down abortion clinics. Since arriving in Albuquerque in July 2010 they have begun to implement those strategies by stripping away the layers of the abortion industry and by educating the public with the truth about abortion. When the Shaver’s arrived in New Mexico there were seven abortion clinics, as of January 1, 2012 there are only five! The retirement of abortionists Lucia Cies in Santa Fe and Bruce Ferguson in Albuquerque at the end of 2011 is proof that when pressure and exposure is applied through peaceful legal means abortionists aren’t willing to continue killing babies! The Shaver’s have researched and uncovered, that the injustice of abortion is deeply entrenched in New Mexico. New Mexico is one of 15 states in the country that force tax payers to foot the bill for abortion! The state also has virtually no laws protecting the pre-born and those who are in positions of authority have proven to be apathetic and unwilling to act. Abortion clinics are running amok in New Mexico, with virtually no oversight from the Health Department or other state agencies to ensure unsuspecting women’s safety! Albuquerque is also home to the notorious Late Term abortion clinic Southwestern Women’s Options (SWO) run by abortionist Curtis Boyd. Curtis Boyd was an illegal abortionist who harmed women before Roe vs. Wade and continues to put women at risk in his Albuquerque clinic. SWO performs abortions through all nine months of pregnancy unashamedly. Albuquerque is also home to the University of New Mexico which operates a free standing abortion clinic (UNM Center for Reproductive Health) which performs abortions through 22 weeks of pregnancy. The University of New Mexico is attempting to train the next generation of abortionists through a residency training program and has medical students performing abortions. Using the research training they received as interns, the Shavers have begun to uncover and expose a deep seated abortion culture and agenda at the University of New Mexico. In June 2011 Tara obtained fourteen 911 calls stemming fromboth SWO and The University of New Mexico’s abortion clinics through a public records request. While most pro-abortion individuals believe that legal abortion is safe, the Shaver’s have debunked that myth by uncovering the 911 calls. These calls revealed serious abortion complications including uncontrollable bleeding after a punctured uterus, seizures and a ruptured uterus. Once these calls were obtained, Medical Board complaints were then filed by Tara and Operation Rescue. Filing Medical Board complaints in other states has proven to be extremely successful in closing down clinics by the stripping of doctors licenses. Once light is shed on how women are being needlessly injured behind abortion clinic doors the Medical Board is then compelled to act. Bud and Tara have also been diligently working to mobilize the Christian community through education to become actively pro-life. They are also striving to organize and maintain a constant prayerful presence at the abortion clinics in Albuquerque. As a result of their efforts countless lives of women and babies have been saved and Churches are being are getting involved. They have endured persecution and assault as they boldly confront evil every day in order to light up the darkness! The Shaver’s have also helped Project Defending Life open and run their second pregnancy resource center directly across the street from UNM Center for Reproductive Health abortion mill. The Shaver’s collaborate with established Pro-Life organizations in New Mexico, and helped launch Protest ABQ under Fr. Stephen Imbarrato’s direction. With the leadership of Father Stephen Imbarrato the Shaver’s have met with several state senators, representatives, other public officials, and the Governor of New Mexico Susana Martinez numerous times delivering the information they have uncovered into the hands of those who can act. They are working to develop a relevant strategy to address the pertinent Life Issues that face New Mexico. Bud and Tara recognized the abortion crisis and urgent need for outreach in New Mexico and have made New Mexico their mission field. Operation Rescue recently launched the Pro-Life Nation project, and the Shaver’s are an example of what the Pro-Life Nation is, and what it takes to achieve it! The Shaver’s are working to end abortion in New Mexico by implementing proven strategies they learned during their time with Operation Rescue and they are ending abortion one woman, one child, one day at a time! The Shaver’s are full-time Pro-Life Missionaries and raise their own support from individuals who have a heart for their life saving work! 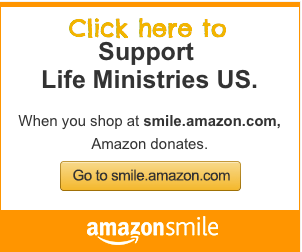 Please prayerfully consider supporting this family so they can continue their effort to end abortion in New Mexico!